Gardening is an activity which allows us to convert a normal piece of land in to an attractive place to spend time. Gardening can also be done with the help of different kinds of container which are easily movable. Some people prefer to have a garden filled with colorful flowers to make their surrounding full of nice fragrance, while others grow veggies and herbs in order to receive healthy food which can be shared with others. Working in a garden refines our thoughts & ideas and helps us to work with more dedication in any work. Having a small size garden has become easy and can be used to produce varieties of things like flower, fruits & vegetables or herbs & shrubs. Plants can be cultivated well using compost and homemade fertilizers. Many people are involved in to grow varieties of things and also make money. By creating small gardens we can add more values to our home. One such variety is a miniature garden where small trees, plants & shrubs are used to create beautiful mini landscapes. Gardening also creates a friendly environment where new ideas can be generated and shared among friends & family. And for small kids miniature garden is a creative way to create real-time designs of their imagination. 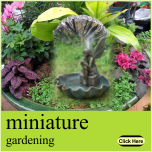 Many parents treat miniature garden as a way of educating their children by using the varieties of accessories in this type of garden. It also helps the children to widen their imagination power and be more creative. There are many herbs which can be grown in miniature garden, useful for the treatment of health problems and serve as ingredients in food or drinks. Thyme is a herb of great flavor. It is available in different varieties and can be used as an ingredient for tea, jelly, soup, sauce or can be used as a salad. It is a type of herb which can be planted in dried soil and cultivated well in full sunlight. Thyme can cure arthritis, diarrhea, stomach ache, cough, colic, sore throat and many more. Mint is a perennial herb that can be grown in sunlight or in a half shaded area. Growing mint is a easy work because it can be grown very well in varieties of soil but a mint grown in fertile soil allows us to receive best leaves. Such leaves can be used for different purposes like tea, desserts, drinks, recipes etc. Mint can also be used to cure common cold, pain relief, indigestion & gas etc. Basil is another herb like others that is used as a ingredient for varieties of dishes and drinks. And also can tolerate high degree of temperatures. This herb needs a wet soil and watering needed to be most preferably in the morning. Getting fresh basil from your garden can add flavor to salads, frozen desserts, soups, pastas etc.